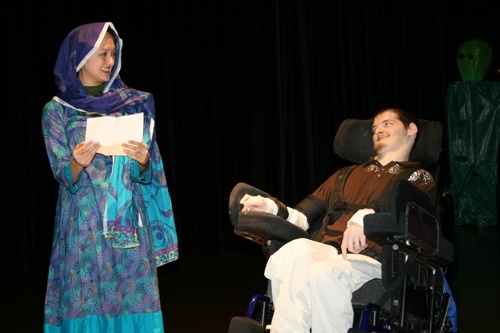 At Full Circle 2011, actress Alexandra Hellquist read “My Pakistani Princess,” written by Mike Cornely, right. You would never expect to see a painting by someone who cannot hold a brush, hear a poem written by someone who has never spoken a word or see a dance choreographed by a person who has never walked. Yet, that is precisely what occurs at Matheny’s Arts Access Program, where the unexpected happens every day. The artists with disabilities at Arts Access use unique methods employed by the Arts Access Program to overcome their disabilities and express themselves in multiple artistic disciplines. Full Circle 2012: Unexpected Art, being held from 3 p.m.-6 p.m., Saturday, November 3, in the Robert Schonhorn Arts Center at Matheny, will celebrate the unlimited artistic abilities of these unexpected artists. To order tickets, call (908) 234-0011, ext. 260, or email pcats@matheny.org. This entry was posted in Uncategorized and tagged Arts Access, Full Circle, Unexpected Art. Bookmark the permalink.